why does this machine require a compressed air while others don't require ?? All smoke machines require a source of air or gas to move the smoke through the system and out of the leaks. You can use a shop air compressor or connect a nitrogen bottle. 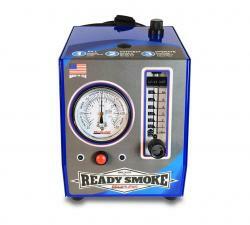 Some other machines have a built in air compressor, but the ReadySmoke requires an outside source to create pressure.